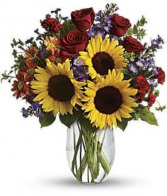 Send this beautiful sunflower arrangement and some unexpected joy to your special someone in Fort Worth, TX! 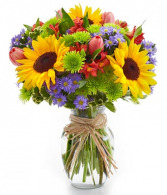 Send this lovely bouquet of sunflowers to your friend or loved one in Fort Worth, TX. A stunning way to send your message on a special day! 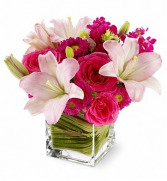 Hot Pink Roses And Matsumoto Asters, Pink La Hybrid Lilies And Burgundy Stock Arrive In A Clear Glass Cube Vase Lined With Variegated Ti Leaves, Orientation: Allaround, Hot Pink Roses, Pale Pink Lilies And Mixed Blossoms, Arranged In A Modern Glass Cube Vase. Easily send a stylishly luxurious floral delivery to Fort Worth with Posh Petals! A lovely and unique flower arrangement perfect for all special occasions.